Kettlebell workouts have recently become mainstream and for good reason. Not only do they burn calories and fat and help build muscle, but they do so simultaneously. Unlike other types of training that fall short, kettlebells deliver a challenging full body workout that’ll keep you coming back for more. Simply put, a kettlebell is weighted cast-iron object that resembles a bowling ball and has a handle on top. They come in varying weights and can be used for a variety of exercises. Originating from Russia centuries ago, kettlebells were initially used as markers of strength and went on to be used in military training. Nowadays, kettlebells are commonly used for general fitness and have even been incorporated into group fitness classes. Let’s take a closer look at what can be achieved by training with this efficient apparatus. One reason why kettlebells have become so popular is because they’re a great option for getting a full body and cardiovascular workout at the same time. This makes kettlebell training the perfect choice for busy moms on the go, business professionals with short lunch breaks and those with tight schedules. Kettlebells are the embodiment of functional training. This means the training is basic and kettlebell exercises mimic real life movements such as lifting and bending forcing the body to work together as one unit. Unlike training that focuses on one muscle group, kettlebells operate on the principle of training the entire body as a whole. Because of this, the core muscles must remain contracted which builds strength and endurance. 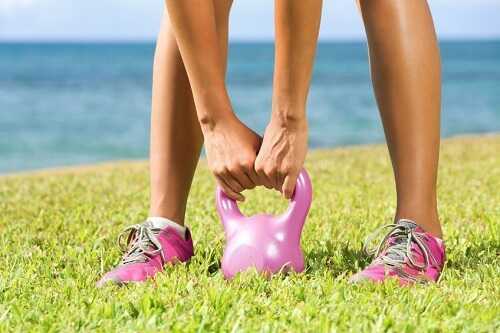 Kettlebells also boost one’s metabolism through the creation of dense muscle mass. With repeated use, kettlebells will achieve your fitness goals and sculpt the body of your dreams. In order to use kettlebells effectively, one must perform the exercises with the proper technique. It’s smart to enlist the help of a certified kettlebell instructor for the first few workouts to prevent injuries. Some of the most popular exercises you’ll learn are basic swings, squats, cleans and presses. As your level increases, all the basic exercises can be amplified by using a heavier weight or even two kettlebells in some cases. Kettlebells are also great for the rehabilitation and prevention of injuries. For example, the connective tissues are strengthened through the acceleration and deceleration of this moving weight through the air in addition to the strengthening of the connective tissues. Kettlebells positively affect the back as well by conditioning it constantly throughout the training session. Overall strength and flexibility is vastly improved which reduces the chance of injuries. Most importantly, kettlebell training is suitable for men and women of all fitness levels. Exercises can be modified to meet everyone’s needs ranging from top athletes to those who have never worked out a day in their lives. At this point, your curiosity is most likely sparked. Take the plunge and find a certified instructor today. Try an introductory kettlebell course. Your body will thank you later.